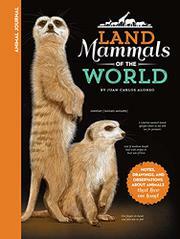 A select portrait gallery of terrestrial mammals, enhanced with close-up details and zoological notes. Alonso (Early Cretaceous, 2015) switches from dinosaurs to extant wildlife (domesticated animals, including Homo sapiens, don’t make the cut here), presenting in no particular sequence representative members of 15 mammalian orders in dignified but lifelike poses against neutral-toned backgrounds. The accomplished artist portrays each subject not to scale but with careful exactitude—every hair, claw, spike, and wrinkle seemingly individually drawn—and surrounds each with descriptive notes printed, mostly, in a faux-cursive typeface. Along with pointing out salient physical features, the notes include species names, ranges and sizes, diets, and International Union for Conservation of Nature statuses from “Least Concern” to “Critically Endangered.” He also adds occasional inset looks at individual paws or feet, expands his section on the Chiroptera (bats) with two subgalleries of close-ups to highlight their startling diversity of facial features, and injects momentary drama by catching a hyena, a Kodiak bear, and, in a head-only shot, a puma in midroar.